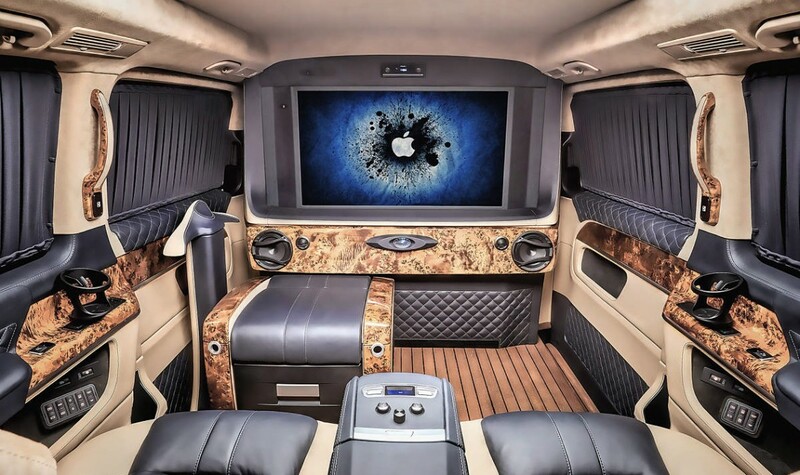 Those who converted these cars call them “mobile offices”. But we’d just refer them as “the throne room”. 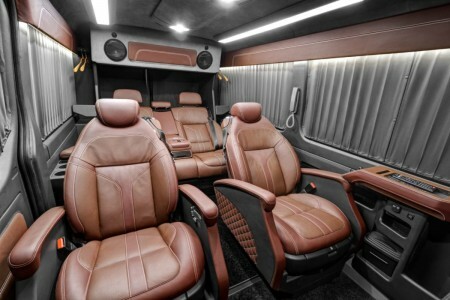 The Russian tuning studio REDLINE Engineering showed its own vision on the Mercedes-Benz vehicles, starting with the V-Class and the Sprinter. With a powerful diesel engine that solidifies confidence on the highway, the latest version of the Mercedes-Benz V-Class turned out to be quite a playground for the tuners. Fitted with a pneumatic suspension, the V can bring comfort to two to four passengers and the opportunity to communicate freely, work or relax. Relaxing is now taken to a whole new level by REDLINE Engineering. They set up a luxurious lounge space for two, separated from the chauffeur by a soundproof wall. The partition wall is made of a double-glazed window that changes transparency, offering as much privacy as needed. The occupants can enjoy watching the 40-inch TV that covers most part of the wall. For the workaholics, the TV offers the possibility for a laptop connection. The Apple TV is also connected to a special 3G/4G module, receiving signal from 4 mobile operators, providing internet access at speeds of over 300 Mb/s. As a variation from the comfortable seats, the car is now equipped with an ultra comfortable sofa, that integrates storage spaces, but also features such as massage, heating and ventilation. The floor of the minivan is covered with yacht teak. As for the Sprinter, REDLINE Engineering worked on a vehicle widely known to do the jobs of trucks or buses, to turn it into a comfortable 5-seat van. Just like in the V-Class, the interior reserved for the driver has been divided from the space of the passengers. The partition wall supports a 32-inch TV screen. A sofa and two armchairs, all fully adjustable, fitted with massage and ventilation functions, complete the décor of the Sprinter’s interior. The occupants benefit from the full comfort of a newly installed automatic air suspension on the rear axle of the vehicle. 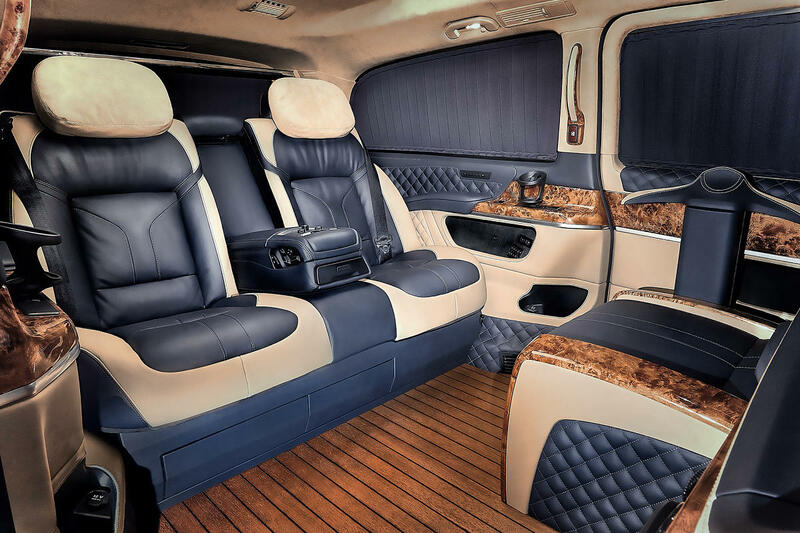 The interiors of both the V-Class and the Sprinter are wrapped up in the best of materials, like the Hans Reinke genuine leather, Alcantara and veneer wood. Both have been sound-insulated, so the noise-vibration in them reaches the low level provided by the S-Class itself. Party in the outer space! 20 million Mercedes-Benz fans on Facebook are invited!